Well! It's been such a long time since I have updated! We certainly had orders since 12/3 but with all of the holiday craziness, I never found the time to get everything posted. I promise to get those pictures up very soon! I know this is our cake blog but many of the people that follow us also know that we were expecting twins this month. 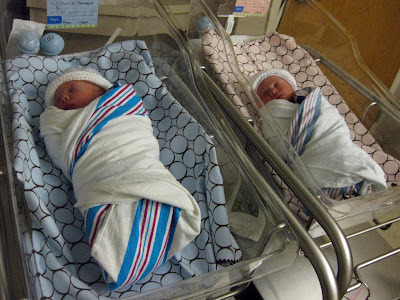 Part of the reason for my lack of posts is that they came a little bit early! Our holiday was great - we stayed in town for Christmas this year (first time I haven't been to Austin in I don't know how long) and started focusing on getting things ready for the babies. I had an appointment the Monday after Christmas (the 28th) for a weekly check up. I hadn't progressed ONE BIT! Nothing was happening, my body was not preparing itself to have these babies in any way! 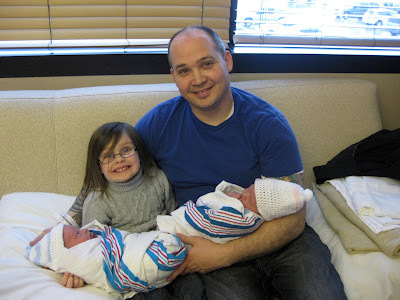 We left the appointment that day a little discouraged (my c-section was scheduled two weeks later) but decided to start walking as much as possible. We walked for 2 hours that night. The next day, Rodney made me an appointment with my hair stylist. After the appointment, we walked the mall for 3 hours! Wednesday we went with Rodney up to CUT so he could take care of something a client needed. Afterwards we headed to Northpark Mall and walked for a whopping FOUR HOURS. I thought my feet were going to fall straight off. We came home, I took a bath and felt like maybe we'd over done it a bit. The next morning I woke up feeling very lethargic and just ... not right. We took my blood pressure, it was 156/110 so we put in a call to the doctors office. They wanted us to come in immediately. Thinking we were just going to go in for a quick check, we jumped in the car. I was in my pajamas, no make up on and nothing with us. I cried the whole way there because I felt just awful! When we got to the hospital/doctors office, I vomited in the parking lot. We were taken into a room right away. My doctor came in pretty concerned and did a cervical check. He said I hadn't progressed that much more but that he thought things were starting to take a turn for the worse. My blood pressure was elevated and I was in a lot of pain. He told the nurse to call up and book the OR. He told us to go on upstairs. We were a little panicked. We had Rylee with us and NONE of our things! We started making phone calls to let everyone know we were headed upstairs. Once we got into triage and they hooked me up to all of the monitors, they told Rodney he had a short amount of time to get Rylee somewhere and pick up a few things. I sat in triage by myself, which was not all that fun. The nurse was monitoring me and apparently the pain I was feeling were very strong contractions. Very strong, very LONG contractions. I had no idea what that even felt like! I never had one with Rylee so this was a new experience for me. Rodney made it back with TEN minutes to spare. Literally ten minutes after he got there, we were going into the OR. I hate that part. The part where you have to be in there by yourself. Fifteen minutes later they brought Rodney in and were ready to begin. Logan Elliot was born on 12/31 (yes, new years eve!) at 1:33 pm and weighed a whopping SEVEN pounds! Hadley Reed was born on 12/31 at 1:35 pm and weighed in at 6.2 lbs!! It all happened so fast! We went into the doctors office at 11:15 and by 1:33, we had baby number 1! We were totally unprepared - if you know me at all, you know that I really like to have things together and in order. So not the case! Our Christmas tree was still up, we hadn't installed the carseat bases into the car, we needed to clean the car out, the bathrooms were not cleaned, house not vacuumed, nothing sterilized and no bags packed!! The nursery has been ready for a while and amidst all of our walking, we did manage to completely overhaul Rylee's room and re-do her closet. When I say redo, I mean - we got the novel idea of making over her closet at 8:10 on a Tuesday night. We jumped in the car and raced to Frisco in order to get to Ikea. We got there at 8:50 (it closes at 9), got the stuff we needed, drove home, put Rylee to bed in the nursery and then spent the next several hours tearing out and repairing her closet. Last minute project but I am glad we go that in! We had a great stay in the hospital - I loved all of my nurses. They were all warm and caring and even the hospitality staff took great care of us. The babies didn't have to go to the NICU and were allowed to stay in the room with us! 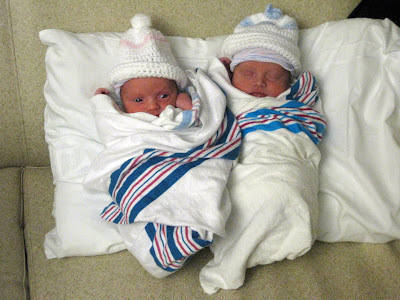 They are considered pre-term because they were 36 weeks when they were born but amazingly, they had no problems at all! 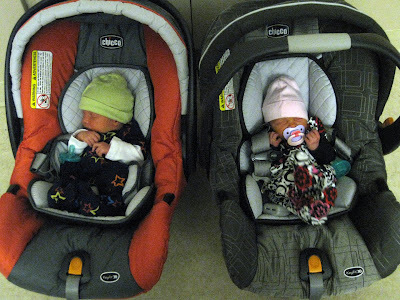 In the carseats for the first time! So far everything has been great! We can't believe the babies were born on NEW YEARS EVE! We call them the "party babies." We watched the ball drop in our hospital room, with the babies by our side and a nurse taking my vitals. Couldn't have been better! We left 3 days later, Sunday evening. The first day or two was a little rough but by now, we seem to be getting into a bit of a groove. Rodney was off all last week and is off this week as well. I seriously tear up at the thought of him going back to work next Monday. I don't know how I will survive without him! He has been amazing throughout this entire thing. 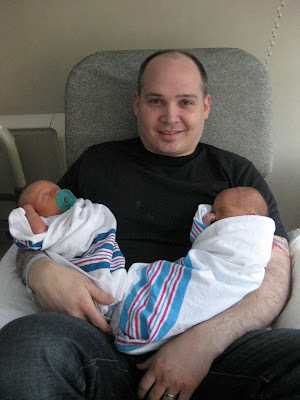 The recovery from your second c-section is SOOOO much worse than the first! Why didn't anyone tell me that?? I have already had problems with my incision opening in certain places and I feel like I might have busted something on the inside. People keep telling me to slow down, maybe I should listen! Anyway, the babies will be 2 weeks old tomorrow and so far, they are pretty amazing. They hardly cry at all (far different from Rylee) and they seem to be pretty easy going. (Logan does have a bit of a temper though). We even managed to make a cake and 3 dozen cupcakes last week and they were less than a week old! I should have more cake pictures up very soon! Congratulations! They are gorgeous babies. Hope you are doing well and sneaking in a nap here and there. Congratulations! I kept checking the site and I knew those babies had to have arrived. They are beautiful - all your children. Good luck. so glad you wrote a blog! the twins are gorgeous and Rylee looks so proud. Congrats to you and your fam! Congrats!!! I was wondering about you!!! The babies are adorable!